Welcome to your March AudioSynced Roundup! 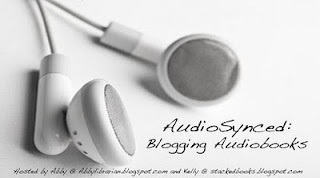 Here you'll find reviews and posts about audiobooks from around the blogosphere. Did I miss your link? Please leave me a comment and I'll make sure to add it! Didn't review an audiobook this month? Never fear, AudioSynced will be back next month, hosted by Kelly at STACKED. Did you know that Audible hosts an annual Tournament of Audiobooks? I had no idea, but apparently this is the fourth year! Audiobooks represented in the tournament are editors' picks, bestsellers, customer favorites, and critically acclaimed. Customers are invited to vote for their favorites in each match-up. Here at Abby the Librarian, I reviewed If I Stay by Gayle Forman, read by Kirsten Potter and the first three Princess Diaries books by Meg Cabot, read by Anne Hathaway. Kim at STACKED reviewed Stargirl by Jerry Spinelli, read by John Ritter. Melissa of The Book Nut reviewed Hattie Big Sky by Kirby Lawson, read by Kirsten Potter and The House at Pooh Corner by A.A. Milne, read by various British authors. Beth of A Foodie Bibliophile reviewed The Incorrigible Children of Ashton Place: The Hidden Gallery by Maryrose Wood, read by Katherine Kellgren. Seth of Free Listens reviewed The Thirty-Nine Steps by John Buchan, read by Adrian Praetzellis, and The Lion, the Witch, and the Wardrobe by CS Lewis, read by Dr. Chrissi Hart. Sarah of GreenBean TeenQueen reviewed Love Aubrey by Suzanne LaFleur. Over at The Hub, Emily reviewed Jumped by Rita Garcia-Williams, read by Shari Peele, Cherise Booth, and Bianca Vasque. Kat of Kat and Books reviewed White Cat by Holly Black, read by Angie's boyfriend Jesse Eisenberg. Melissa of Mel's Books and Info reviewed Eona: Dragoneye Reborn by Alison Goodman, read by Nancy Wu. Brenda of proseandkahn reviewed Charles and Emma by Deborah Heiligman, read by Rosalyn Landor ; Fire by Kristin Cashore, read by Xanthe Elbrick ; Jellicoe Road by Melina Marchetta, read by Rebecca MacCauley ; and Torment by Lauren Kate, read by Justine Eyre. Shalini of Reading (and Chickens) reviewed The Lightning Thief by Rick Riordan. Lee of Reading with my Ears reviewed Black Duck by Janet Taylor Lisle, read by David Ackroyd ; Boom! by Mark Haddon, read by Julian Rhind-Tutt ; Gone-Away Lake by Elizabeth Enright, read by Colleen Delaney ; The King's Gambit by John Maddox Roberts, read by Simon Vance ; Our Man in Havana by Graham Greene, read by Jeremy Northam ; and The True Meaning of Smekday by Adam Rex, read by Bahni Turpin. Lisa of Shelf-Employed reviewed The Genius Files: Mission Unstoppable by Dan Gutman, read by Michael Goldstrum. Tahleen of Tahleen's Mixed-Up Files reviewed Looking for Alaska by John Green, read by Jeff Woodman and The Off Season by Catherine Gilbert Murdock, read by Natalie Moore. Don't forget to check out Audiobook Jukebox for links to lots more audiobook reviews around the blogsophere! And hey, did I miss any links? Leave 'em in comments and I'll add 'em to the roundup!